The history of bottle tickets provides a fascinating insight into English eating, drinking and personal habits. Contemporary gazettes begin to refer to ‘labels for bottles’ in the 1770s but it was not until the 1790s that they were established as wine or decanter labels. Their function was to identify the contents of a bottle or decanter, which might alternatively contain spirits, sauces, toilet waters or cordials. 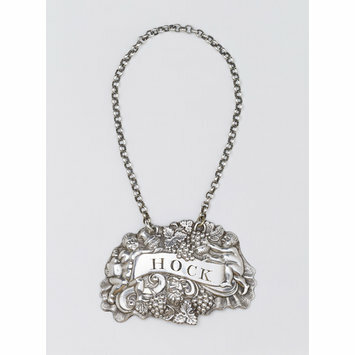 These tickets also illustrate in miniature, the skills of the silversmith over the last two hundred years. 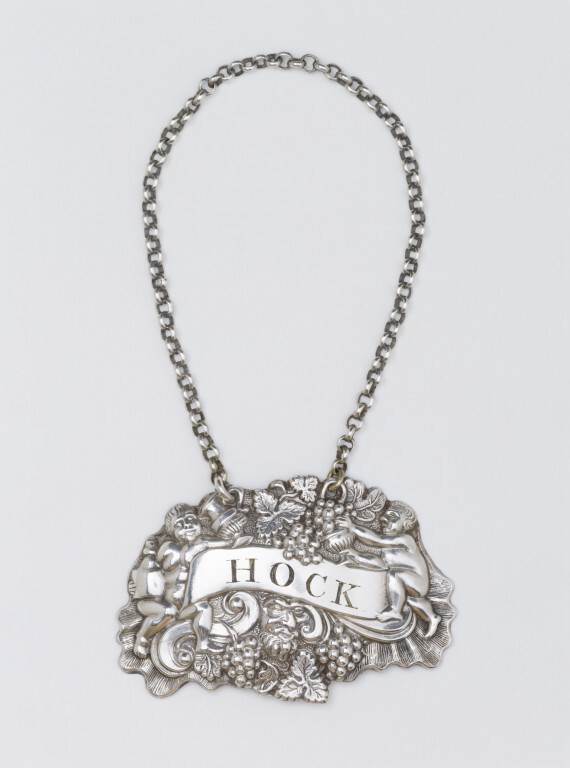 While the variety of styles and materials were enormous, silver bottle tickets tended to reflect fashionable designs in metalware generally. Makers were quick to adapt the many technical advances of the 18th and 19th centuries. Bottle ticket with the word HOCK. Silver, repousse with a ribbon supported by two Bacchanalian boys with grapes and wine vessels, and below, scroll and shell work and a mask; chain attached. Silver, Sheffield hallmarks for 1809-10, mark of R. Gainsford.